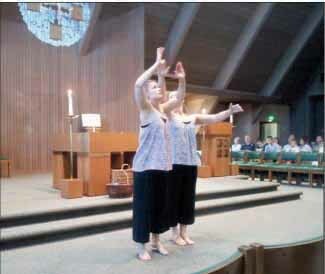 Home › Choreography › Glimpses of Sacred Dance in California By Sister Martha Ann Kirk, Th.D. 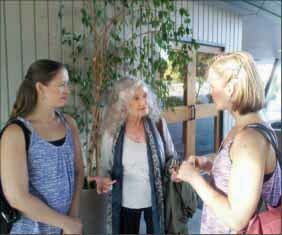 Glimpses of Sacred Dance in California By Sister Martha Ann Kirk, Th.D. 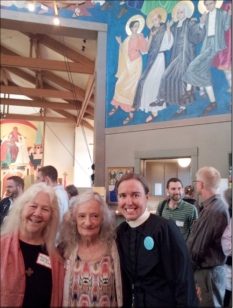 While in California to interview Carla De Sola, a leader in sacred dance for almost half a century, Sister Martha Ann Kirk enjoyed dance for the closing and opening ceremonies of churches, dance in a special Eucharist focused on hope in the face of cancer, and congregational dance enriching worship every Sunday. 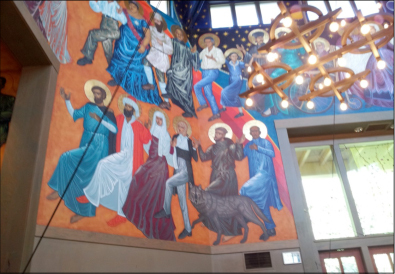 On June 29, 2013, the Roman Catholics of the Diocese of Orange County had a Closing Ritual to leave the campus of St. Callistus Church which would then be used by the congregation of Dr. Robert Schuller’s Church which had been called the Crystal Cathedral. Seventy-nine dancers enriched the prayer service which called attention to the different areas of the church and parish complex in which good things had happened, such as Baptism, Eucharist, Reconciliation, education, and administration. The ceremony was full of movement and symbol as the people expressed gratitude in each place. The congregation then moved down Lewis Street to celebrate the first Eucharist on the campus of what is now called Christ Cathedral. Vietnamese American dancers brought joy and hope. Throughout the ceremony there were prayers and songs in English, Spanish, Vietnamese, and Tagalog reflecting main cultures of the population. Bishop Kevin W. Vann even spoke in three languages. 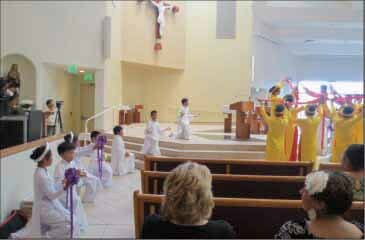 They began dancing there in their home parish when they were nine years old. Now as adults they live in New York City and with Martha Chapman are co-directors of Omega Dance Company which Carla De Sola directed at St. John the Divine Cathedral from 1976 to 1990. They bring vibrant energy and talent to Omega. http://omegadancecompany.org/calendar/. Sister Martha Ann Kirk, Carla De Sola, and Sylvia Miller-Mutia, one of the priests of St. Gregory of Nyssa Episcopal Church chat after Sunday Eucharist. De Sola has been choreographing a dance for the opening of the exhibit “Birds of Longing” at the Doug Adams Gallery at the Pacific School of Religion, Berkeley on September 11, 2013. Miller-Mutia is one of the dancers.